The perfect villa for 2 guests! Our 1384 Pelican Watch Villa is an extremely popular choice for couples. This upstairs, end unit offers a retractable awning for those hot sunny days. Enjoy panoramic views from the deck. 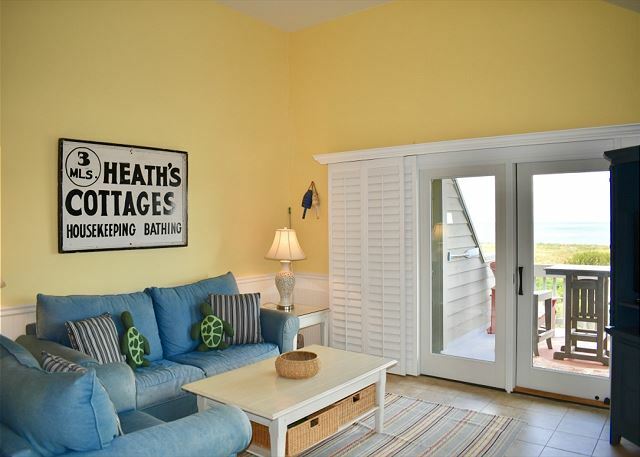 The decor is adorable with beadboard accents, tile flooring, attractive colors and custom plantation shutters . The updated kitchen is appointed with tile counter tops and a decorative tile back splash. There is a washer/dryer in the villa right next to the kitchen. The living area offers abundant light from the extra windows. 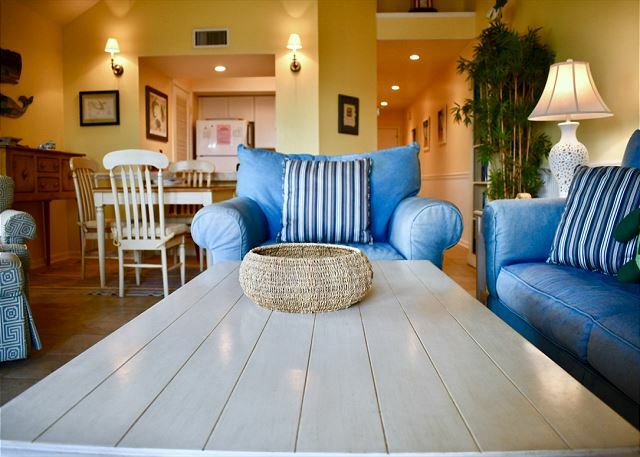 The sofas are quite comfortable and inviting after an active day on the island. The bedroom has a king bed, private bath and flat screen TV. Enjoy wireless internet and free amenity cards too! . Condo was great, all we could ask for. View was even better, beautiful sunsets. 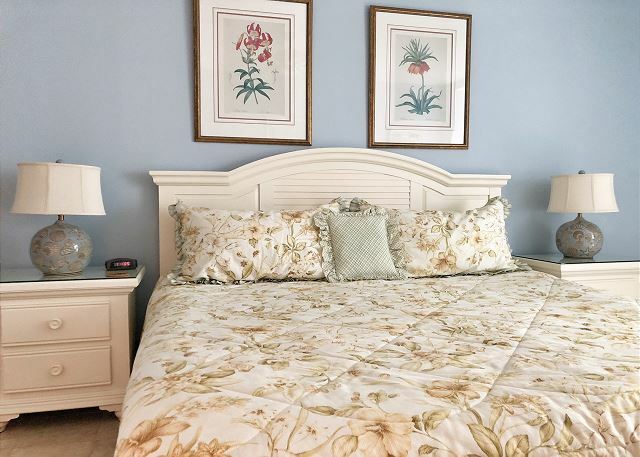 1384 is a very comfortable, well appointed beach villa. Everything is as described; everything we needed in the kitchen, the awning on the deck, and the use of beach towels and chairs are a plus. The staff is very helpful and professional. Be aware that the owner stores bicycles in the only available closet so storage space is limited. The Pam Harrington agent was quite helpful in suggesting the best available condo. The unit was sparkling clean, nicely furnished with a gorgeous view of the ocean. We would be glad to rent from Betsy again. 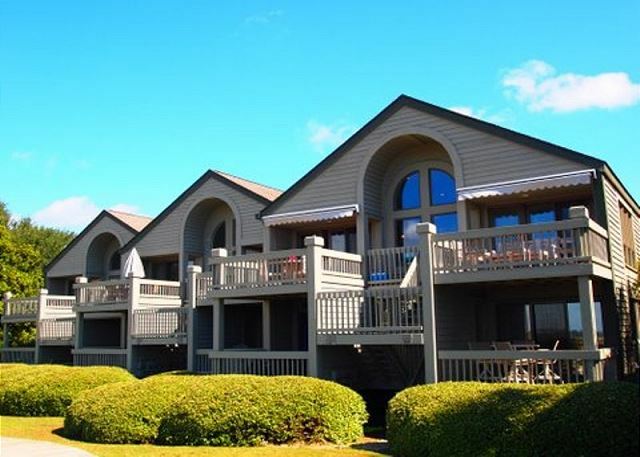 We had the same excellent service in October when we rented a different unit at Kiawah. 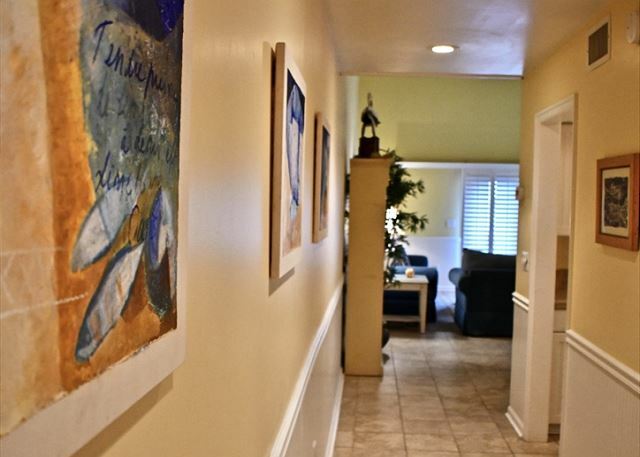 Overall a comfortable corner (more light and views)condo with solid but basic furnishings. Limited on storage due to bikes in only closet which is ok for a couple for a few days but may not be for a family. Excellent! Thanks for including salt, pepper, and butter! 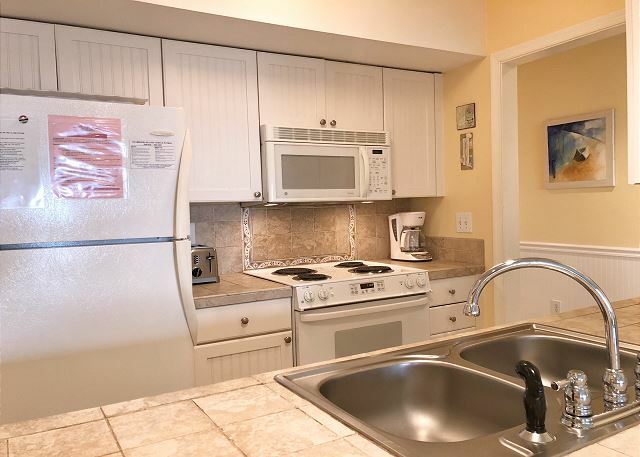 The unit is immaculate, the kitchen is fully stocked with cookware and dinnerware, and the view outside is great. All furnishings were comfortable, and the décor is very pleasing. Plenty of golf courses, tennis courts, restaurants, shopping and a gourmet grocery store nearby. One recommendation is to have an umbrella or awning on the deck. Had a wonderful time at this lovely condo, wanted for nothing, perfect location and amazing view and sunsets. wedding on the beach, with sunset as our background. perfect!! We loved our stay so much, we extended it three more days. Beach front views of sunsets every night, deer eating and living in the thicket below, and all the conveniences of home. We will be there again. Property is especially nice for 2 people with a corner unit and unobstructed views. Will stay here again if price is same or cheaper for a week. Great spot in Seabrook. Great sunsets and perfect for walking. Our only concern with Seabrook is weather related. You can have significant periods of cold and rain. Great spot though! Very comfortable villa with fantastic views of beach! Unit well designed and very nicely decorated. It needs to have the security door on the deck installed like the other units and should have an awning or umbrella on the deck so guests can sit outside and enjoy the spectacular view during the day. Great view and location. Perfect for two people. Absolutely wonderful. The reservation process was easy and informative about the locale. The setting was beautiful. 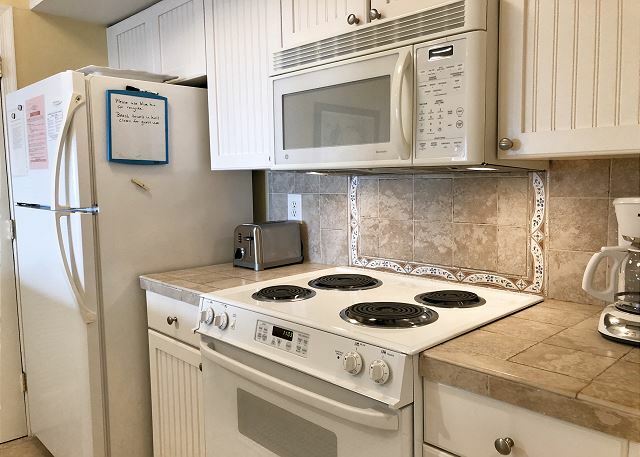 The unit was very clean, comfortably furnished and extremely well stocked with paper products, cleaning supplies, dinnerware and cooking utensils. Plus a bookcase with great reading materials including lots about the Carolina Low Country. This was among the best values we have encountered. We enjoyed our visit the first time so much, we came back again this year. The location is peaceful and the views are excellent and the property had everything you could need. A comfortable location for great stay. We have stayed in this unit before and will try to again. Lots of light in this unit! It is very convenient and comfortable. 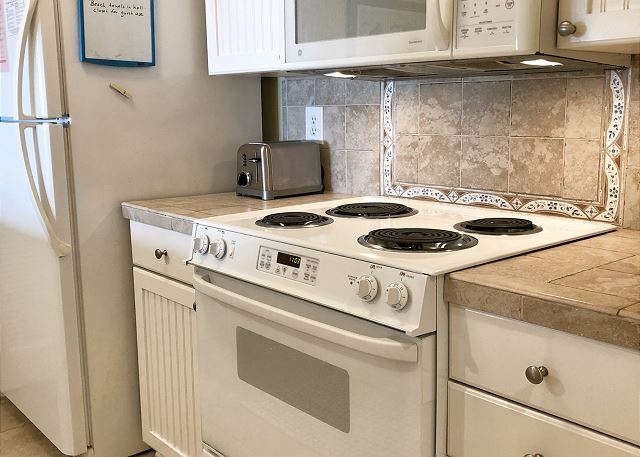 We would love for the owners to put a bit more attention on the kitchen! Another good time on Seabrook Island! The villa and pool amenities were very relaxing. The beaches are clean and fun to bike on or take long walks. The Pam Harrington staff were very nice, as usual. Our second visit to Seabrook was once again extremely relaxing. Started each day with a long walk on the beach, watching the pelicans soaring overhead, the shrimp boats coming in, and sea turtles taking their first swims. Great eats at Chez Fish and Red's Ice House. Nice to have the shopping center nearby for immediate needs. Will be back soon. We spent a terrific 10 days in this unit. It is well appointed and has wonderful views. Another plus is the short walk along the boardwalk to Pelican Beach. We have rented through Seabrook Exclusiveears for a number of years and have never been disappointed. 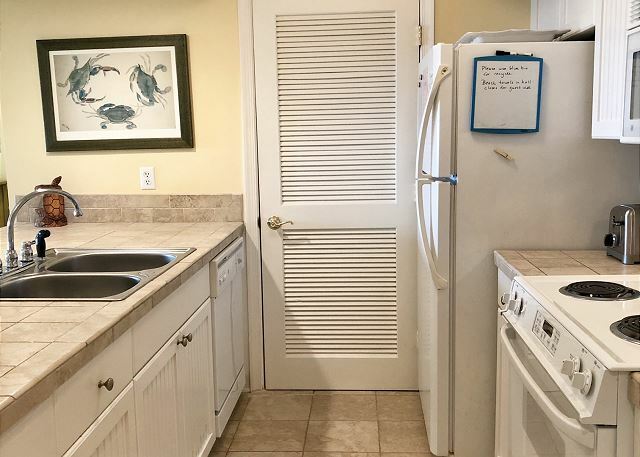 Our only suggestion for improvement is to the owners of this unit-- they should free up a little more closet space--there was no place to put our luggage. But overall it was a wonderful place to stay. Overall was really great but could not connect to Internet. That was only fault. 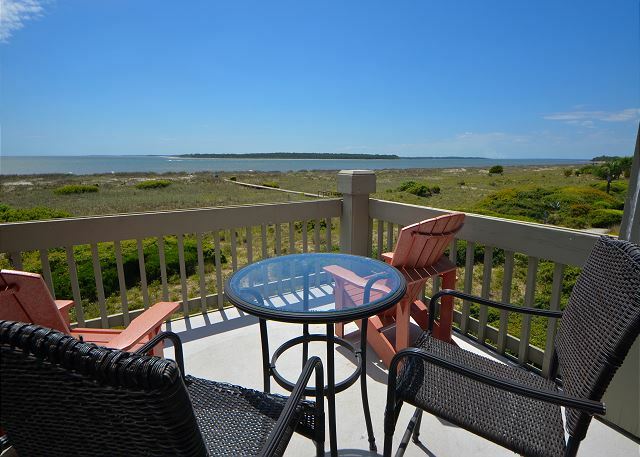 We appreciated the upper deck which enhanced the amazing views of beaches, ocean, dunes and sunsets. We had up close encounters with pelicans, deer, crabs, stingrays and dolphins. Booking the accommodation over the Internet was easy and very convenient. 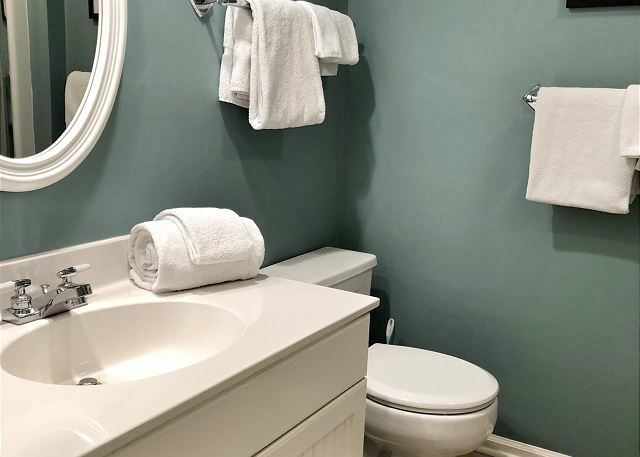 The staff at Seabrook Executives were responsive to our booking and followed up to ensure that we were happy with our accommodation and our experience. 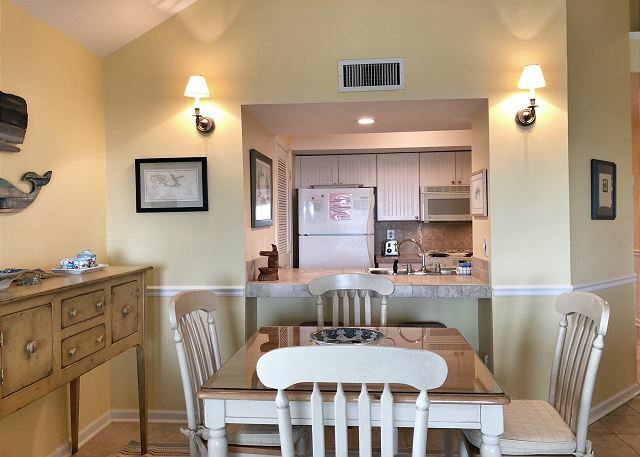 A quiet condo with beautiful views in a friendly resort. We had a great stay on Seabrook. My only recommendation would be new pillows on the master bed and a new coffee pot that turns off by itself after an hour or so. Otherwise, great experience. We had a great week in the apartment. 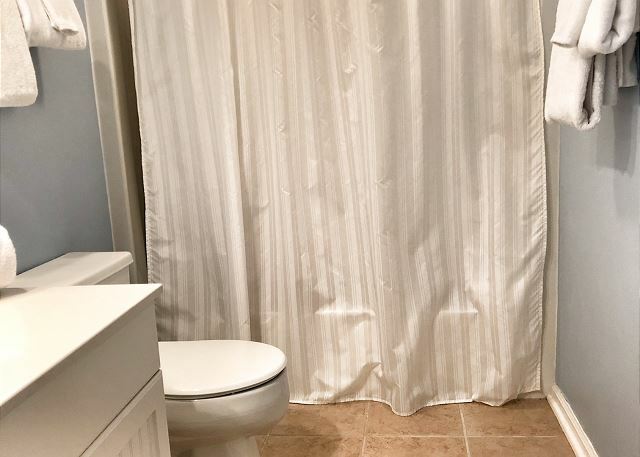 Because it is an end unit and has an additional window the apartment is nicely light flooded. We saw great sunsets every day because you just have to go on your deck...or look outside of your windows. We also saw dolphins when sitting on the deck and deer too. The apartment was very clean, it is nicely decorated and everything is in very good condition. When coming back to Seabrook we will book it again. We loved our week at Pelican Watch -- lovely views, beautiful villa, great food close by. Thanks for everything! What a delight to work with Kat! We had a wonderful vacation at 1384 Pelican Watch at Seabrook Island. It was a great locaton providing a very relaxable, enjoyable atmosphere on the beach! Susan with Seabrook Exclusives did an excellent job describing the property and facilating the reservations! Seabrook Island was fantastic! Comfortable. Kitchen not well equipped. Drip pans on stove rusted. Should have been replaced. Lights needed replacing in kitchen. Great location as end condo. Very comfortable and well outfitted villa. Would gladly stay there again!